Aiming to conserve, preserve, restore and protect "those joyful little buildings which aim to please", the Follies Trust works across the island of Ireland. 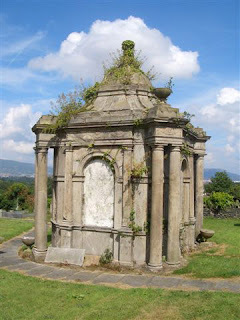 Their current project is "to conserve and restore three grade B+ (equivalent 11*) listed mausolea in Knockbreda churchyard, Belfast" (pictured above). The Trust also hosts lectures and events in Dublin, Lisburn and elsewhere - still to come in Spring 2009: a lecture by architect Andrew Cowser on Follies in the Twentieth Century (31st March), and a walk in Knockbreda graveyard with archaeologist Dr Finbar McCormick (30th April). More info here.